Having lived in five countries, Josh is fluent in all types of eating. A recovering journalist, he loves meeting people who inspire him, and enjoys unearthing stories about everyday people helping other people. The morning before Mr Lee Kuan Yew died, my family joined Runninghour’s ‘Run So Others Can’ event at Marina Bay’s Promontory. It was a unique event, giving participants the opportunity to try running part of the distance blindfolded. 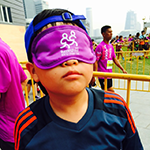 My son, wife and I each took turns running blindfolded and guiding for a few hundred metres, before completing the 5km event sighted. Running blind was nothing like I’d imagined. Seems obvious, and I thought I knew what it would be like. But it was much tougher than I’d thought. “Straight”, “right” and “left” lost all useful meaning. I couldn’t get my bearings, so I didn’t know if I was running in a straight line or headed straight for the water. I shuffled my feet as much as I dared, moving barely faster than a walk, as my nine-year-old son held the other end of the rope I was gripping tightly. He had done the first couple of hundred metres blindfolded before we switched, and was now offering guidance and direction to me. Too sporadic and generic for my comfort (“there’re some people ahead”) and, I suspected, too slowly to help me avoid danger. My fears were first confirmed when I touched a backside that didn’t belong to either my wife or my son. And not long after, I ran off the pavement into some scrub and nearly slammed into a tree. When I took off my blindfold, I saw blind and special needs runners in full stride with their guides. I’ve known of these runners for a while now, and have always admired them. But having had just a small taste of their world, I now know they are even tougher and more amazing than I’d thought. Kudos to Runninghour for a great race – their first one. The route was scenic and provided comfortable space for runners and walkers of every speed. Marshals were plentiful, encouraging and cheerful. There were medics on bicycles and golf carts always nearby. Things were straightforward before and after the race. There was no need to navigate a huge maze of barricades or stand in long lines for anything. Runners cooperated too. Everyone threw their cups into the ample trash bags provided. I didn’t see a single stray cup! My wife and I ran about half the way and walked the rest. Our son managed a little bit more. But he was kind enough to wait for us and we crossed the finish line together, with people cheering us on. The cheers went up a notch when, a little while later, a lady in a wheelchair and her partner came in together with a big group of regular Runninghour volunteers who were bringing up the rear of the race. Just a few metres shy of the finish line, the whole group stopped short. The lady in the wheelchair – Phyllis, as I found out later – stood up and walked, very slowly with the aid of a walking stick, towards the finish line. In the background was Marina Bay Sands, the building that has come to symbolise Singapore’s success. Using sports to promote integration and nurture inclusiveness is the goal of Runninghour. I’d like to imagine that Mr Lee would have enjoyed seeing the integration, inclusiveness and Phyllis’ tenacity that day, thriving in the city that he loved. Watch the Runninghour story and sign up for Runninghour 2016. Copyright © 2017 Our Better World, the digital storytelling initiative of the Singapore International Foundation, which brings world communities together to do good.